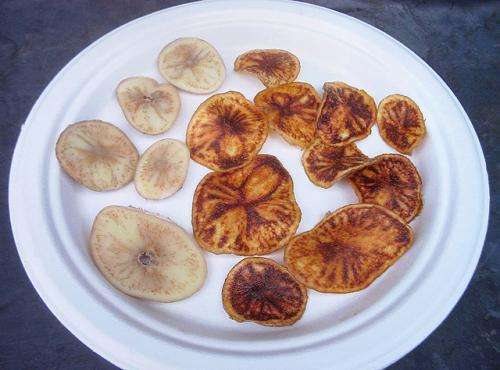 Zebra chip symptoms in potato slices from infected tubers in uncooked (left) and fried chips (right). The disease poses no consumer danger, but it affects potato taste, appearance, and marketability. Credit: Joseph Munyaneza. Researchers are leaving no stone unturned when it comes to finding new ways of managing zebra chip disease and the insect that can spread it to potato crops. One scientist, Agricultural Research Service entomologist Rodney Cooper, is using fine-tipped forceps and a fluorescent microscope to study the organs and tissues of the potato psyllid, a tiny, cicada-like insect that can transmit the bacterium Candidatus Liberibacter solanacearum, the cause of zebra chip. Cooper combines the procedure with fluorescent genetic markers to understand where and how Liberibacter survives in the psyllid—from the moment it is ingested by the insect pest to the time it is injected into new plants. "Our understanding of the basic biology and ecology of this pathogen, as well as its interactions with the insect vector and host plant, is incomplete," says Cooper, who is in ARS's Fruit and Vegetable Insect Research Unit in Wapato, Washington. Filling this information gap will have wide-ranging benefits, he adds—from improved experimental designs and data interpretation to better decisionmaking on how best to detect, control, and prevent zebra chip. The disease is named for the dark bands it causes inside tubers. The bands become more pronounced once the potatoes are cut and fried to make products such as chips. Other symptoms include curled-in leaves and tissue discoloration. Zebra chip poses no consumer danger, but it affects tuber appearance and taste and can diminish marketability at a cost to producers and processors. The primary disease-control method is to spray potato crops with psyllid-killing insecticides, but researchers hope to provide growers with more sustainable approaches, particularly resistant varieties. In addition to expediting such efforts, information from Cooper's psyllid dissections may eventually set the stage for targeting Liberibacter directly. Once a psyllid specimen is dissected, its excised organs and tissues are subjected to "fluorescent in situ hybridization." This procedure uses special probes to bind to complementary segments of bacterial DNA, which, if present, glows (fluoresces) green. Using this microscope-aided method, Cooper and colleagues have observed Liberibacter in four main areas of the psyllid: the gut, hemolymph (blood), bacteriomes (organs where symbiotic bacteria reside), and salivary glands (where it gets injected into plants during psyllid feeding). Of the organs and tissues examined, Liberibacter appeared most often in the psyllid's gut. 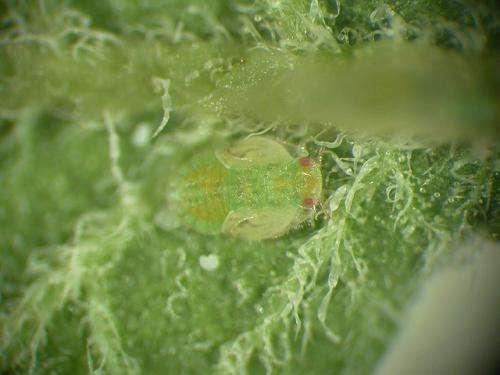 Indeed, bacteria fluoresced green in the guts of 66 percent of psyllid specimens examined. It was also found in 40 percent of salivary glands and bacteriomes. The pest's nymph stage proved less hospitable to Liberibacter, which rarely appeared in organs other than the gut, the researchers observed. "This may represent a bottleneck or barrier in the infection route, which could be manipulated and extended into the adult stage. If the adults don't transmit Liberibacter, then they're less of a threat," says Cooper, who, along with coauthors Joseph Munyaneza and Venkatesan Sengoda, published the work in the Annals of the Entomological Society of America, in January 2014.